Modern Family Dentistry is starting a new referral giveaway for our patients who take the time to refer our office to their friends and family. From July 15th to August 31st when a patient refers a friend, family member, neighbor, or coworker they receive an entry into that month’s special giveaway. 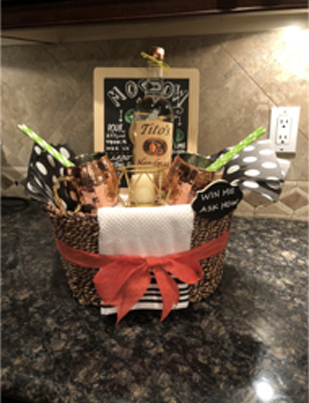 Each Month we will create a new Basket to win. We are so appreciative to our patients who give us the highest compliment by referring their friends and family. Stay tuned each Month to see what we will giveaway next! School is around the corner and summer is coming an end YEAA!. Many of our pediatric dental and orthodontic patients return to outdoor sports and activities in the spring. It is great time to remind you of the importance of taking a few precautions to preserve your teeth and be protected from dental and facial injuries. Play it safe whether at practice, a game or being active in the neighborhood. Wear a mouth guard to help prevent injuries to the teeth, mouth and jaws when practicing or playing team sports, or when skating or riding a bike. Wear a helmet. Helmets absorb the energy of an impact. Wear protective eyewear. Eyes are extremely vulnerable. Be alert even as a spectator. Alert spectators can avoid foul baseballs and flying hockey pucks. Watch your step when climbing bleachers. A mouth guard is one of the least expensive pieces of protective gear available, and it can prevent or minimize dental and jaw injuries. Getting a custom fitted guard will fit better than the box ones over the counter and will protect their teeth and jaw more effectively. Talk about the right mouth guard for you or your child during your next visit with Dr. Stacey Layman DDS and Dr Emily Mack DMD. Modern Family dentistry provides a mouth guard to patients for a summer special of $39 (reg. $200) Feel free to contact the office at 623-979-1900 for more information. New Patients receive Complimentary Second Opinions on dental work plans.